For a unique dining experience, visit the Café Alcazar directly behind the Museum. This elegant eatery is located in the former indoor swimming pool of the Alcazar Hotel, the largest in the world at its time. The restaurant is open daily from 11 a.m to 3 p.m. The Cafe Alcazar has entrances located on Cordova Street and Granada Street which are open from 11 a.m. to 4 p.m. 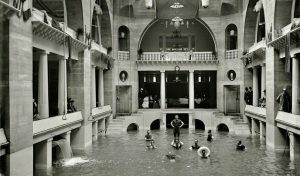 Guests of the Alcazar Hotel “take in the waters” in what was the world’s largest swimming pool. 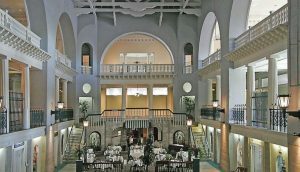 The Historic Pool Area of the Alcazar Hotel is now home to the Lightner Museum’s Cafe’ Alcazar.